Credit: Reprinted with permission from Astrobiology, published by Mary Ann Liebert, Inc., New Rochelle, NY. Scientists now think we may be able to detect signs of life on planets beyond our solar system in the next few decades, but to do so new tools and techniques will be required. Researchers from around the world just produced a roadmap to develop the techniques that may finally answer the question of whether we are alone in the Universe. This work was published this month in five papers in the journal Astrobiology. These papers will serve as a reference for future research into how scientists can search for signs of life in the cosmos using telescope observations. Scientists estimate there may be planets around almost every star in the galaxy. Planets orbiting stars beyond our own Sun are called "exoplanets." In fact, the pace of exoplanet discovery has been so rapid – over 3,500 have been found since the first in 1992 – that a meeting of scientists from many disciplines was urgently needed to synthesize knowledge to advance our ability to find signs of life on these new exoplanets. Formed three years ago, NASA's Nexus for Exoplanet System Science (NExSS) is an international network that brings researchers from a variety of disciplines to understand how we can characterize and eventually search for signs of life, called biosignatures, on exoplanets. Since we can't currently visit exoplanets, scientists must use telescopes to search for biosignatures. These observations will need to push our telescope technology to its limit. To this end, NExSS produced a comprehensive series of papers outlining the past, present, and future of research on how to search for signs of life on exoplanets. These major review papers are the result of two years of work by some of the world's leading researchers in astrobiology, planetary science, Earth science, heliophysics, astrophysics, chemistry, and biology. This work began with online meetings followed by an in-person workshop held in Seattle, Washington in 2016, where scientists exchanged ideas and debated new plans on how to best identify life on worlds beyond our solar system. Several members of the Earth-Life Science Institute (ELSI) and researchers from other institutes in the greater Tokyo area participated in these activities either in person or remotely. These discussions formed the basis of the articles published in Astrobiology. The papers identify several issues in this search and propose solutions to them. There are two major types of signals scientists plan to look for. One type comes in the form of the gases that life produces, for example the oxygen you are breathing right now, which was made by plants or photosynthetic microbes. They also plan to look for the light reflected by life itself, such as the color of leaves or the pigments that give color to algae blooms in the oceans and to the hot springs of Yellowstone. These kinds of signatures can be seen on Earth from orbit, and astronomers are studying new telescope design concepts that may be able to detect them on exoplanets. The group discuss ways nature could "trick" scientists into thinking a planet without life was alive, or vice versa. The scientists review ways that a planet could make oxygen – which is abundant on Earth now due to biological photosynthesis – without life, and how planets with life may have biosignatures besides oxygen. By thinking about such kinds of planets in advance, scientists are now better prepared to distinguish such worlds from planets that are truly inhabited, and how to expand the catalogue of biosignatures scientists can look for in the future. The team also set out to quantify the chances for life and the clarity of its signals on other worlds, which is an incredibly important and difficult challenge. The data that astronomers collect on exoplanets will be relatively sparse; they will not have samples from these planets, and instead will only have data from a single point of light from that world. By analyzing the fingerprints of atmospheric gases and surfaces in that light, they will discern as much as possible about the exoplanet. This includes inferences about the planet's atmospheric composition and climate, and the presence of oceans and continents. 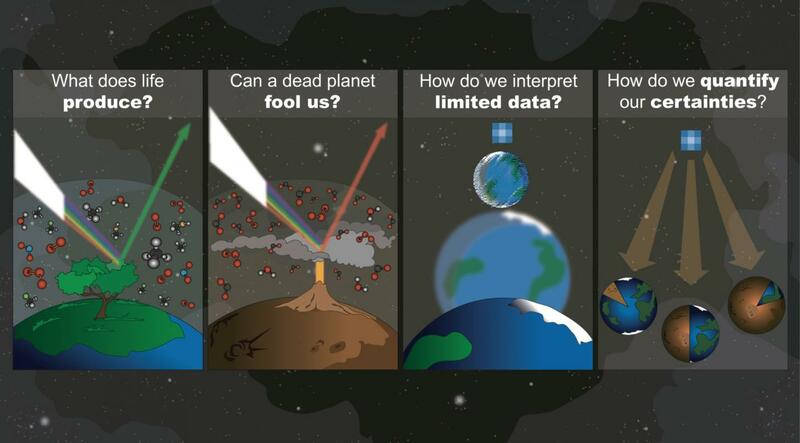 By combining this information in systematic ways and developing new models, scientists will be able to analyze whether data from a planet can be best explained by the presence of life. Based on these models, they plan to set confidence levels on whether biology is present on that world. The new work stresses the need to consider planets in an integrated way, which includes multiple disciplines and perspectives. Lastly, new instruments will be needed – the telescopes that will make the observations necessary for this work. This includes both ground-based and space-based observatories, and both telescopes in operation today and others that will be built decades in the future. These new technologies will not only improve the assessments of the sizes and orbits of these faraway worlds, but also allow deeper analysis of their atmospheres and surface properties. Eventually they may be able to tell us whether they have a potential of harboring life. Mission concepts with biosignature detection as a central driver are being discussed for launch in the 2030s. "Since the mid-20th century, we have seen significant advances in the methods and technologies we can use to make more precise observations and characterize exoplanets. Many of these have been tested on large uninhabitable planets" said Yuka Fujii, a researcher at ELSI and the lead author of one of the papers. The scope of observations is now expanding toward Earth-sized, potentially temperate exoplanets. The data that will be collected over the next decade will allow scientists to better study planets that may harbor life. "The search for life on exoplanets light-years away is an ambitious challenge – it will not conclude with a detection of a single feature, but will require long-term efforts to accumulate a set of "signatures" that cannot be explained by any known abiotic processes and can be plausibly explained by the possible presence of a biosphere." The authors ended with the hopeful assessment that, given upcoming technologies and current knowledge of the distributions of exoplanets, the detection of atmospheric signatures of a few potentially habitable planets could come even before 2030. NExSS is funded by NASA's Astrobiology Program. 1 NASA Goddard Institute for Space Studies (GISS), New York, New York, USA. 2 Nexus for Exoplanet System Science, ROCKE-3D Team, NASA GISS, USA. Launched in 2012, ELSI is one of Japan's ambitious World Premiere International research centers, whose aim is to achieve progress in broadly inter-disciplinary scientific areas by inspiring the world's greatest minds to come to Japan and work on the most challenging issues as a collaborative effort. ELSI's primary aim is to address the co-origin and co-evolution of the Earth and life. The World Premier International Research Center Initiative (WPI) was launched in 2007 by the Ministry of Education, Culture, Sports, Science and Technology (MEXT) in a drive to build "globally visible" research centers in Japan. These institutes aim to boast a very high research standard and outstanding research environment that attracts frontline researchers from around the world to come and work in them. These centers are given a high degree of autonomy, allowing them to revolutionize conventional modes of research operation and administration in Japan.